Is an hands on manipulation of the soft tissue of the body which affects circulation of the blood and lymph, reduces muscular tension, affects the nervous system through stimulation or sedation and enhances tissue healing. For that extra deep massage to allow ‘the whole of you’ to relax, not just the body. The use of warm volcanic stones. The warmth of the stones penetrates deep into the layers of muscle giving extra deep relaxation to the body. Deep pressure/friction massage, performed with smooth bamboo canes to encourage tissue drainage and relaxation. Self heating Tiger Clam Shells, eco-friendly bespoke massage. Warm shells glide over the skin to warm and relax the body. 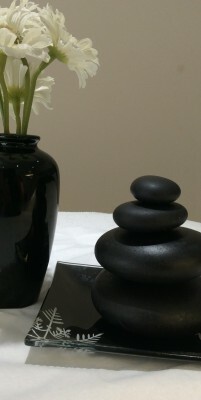 Chakra balancing treatment to energise and revitalise the mind, body and soul using hands-on healing. Created in India thousands of years ago. It is a deep style massage using a variety of different techniques that works to release any blocked negative energy , focuses on the head and shoulders, giving a person an ideal way of being ‘out of their head’ far far away from everyday emotional and mental stress.